I’m already a fan of Landy’s previous work, Demon Road shows some of the same great dialogue and riveting narrative that made his Skulduggery Pleasant series such a great read. But his latest offering is definitely darker in tone and content, with murderous demon parents, twisted witches, and even the heroes are killers. 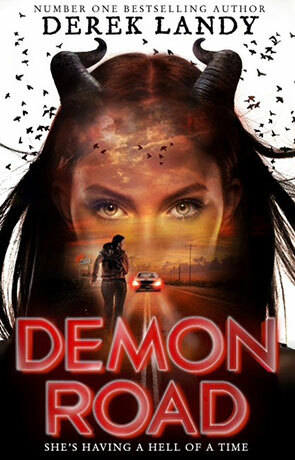 The first of a new trilogy, the book tells the story of Amber, a teenage daughter of demon parents who occasionally sports some horns of her own. The plot follows her attempts to survive her parents’ murderous plans for her, travelling across America in a part quest, part escape story. It’s a trip that certainly won’t be boring; fortunately, as we’re told – America has the best monsters. Beginning with a deal with the Shining Demon to get her parents off her back, Amber’s trip brings her across all sorts of strange people and places. Travelling the Blackroads of supernatural America she battles a cunning serial killer in a miniature dollhouse, grabs a drink with the creepy children in the Dark Stair club, and uncovers the horrifying secret of the sleepy town of Cascade Falls. There’s plenty of action to move the plot along, backed up by some of Landy’s trademark one liners and snappy dialogue. The story is easy to follow and pulls the reader along for the ride as Amber lurches from one peril to another. As a heroine, Amber is quite well crafted, she’s very believable in terms of personality and her actions are entertaining to follow. Landy does a good job of writing this insecure girl who has to come to terms with her demon self. Already likable from page one, she grows over the book and the reader gets to watch her develop. Amber’s narrative is full of humour and attitude, giving real life to the worlds. Joining her for the ride is Milo, the mysterious bodyguard/guide hired to protect Amber. This worldly and cynical figure has a dark past and a dry wit that provide for some great moments of humour, especially when matched against their last companion. Glen is a bumbling Irishman on his own journey who joins up with the group. I did feel that his introduction was uncharacteristically awkward and clumsy for a writer of Landy’s skill, but he rallies later and the awkwardness becomes part of his charm as he falls hopelessly for demon Amber. There’s a lot of hilarious moments in the group, making even the normal road trip scenes fun to read. The characters in the novel are quite well fleshed out, even the archetypal ones have some nice twists going. Side characters get a bit of thought and some nice jokes that are enough to make them feel like real people rather than plot devices. The main villains of the piece, Amber’s parents and their friends, don’t’ get a lot of attention, but there are times when she confronts them and the scenes really take on a sinister tone. Other characters like the serial killer Dacre Shanks are genuinely disturbing and round out a colourful cast. Much of the book has the quality of an episode of Supernatural, detective work mixed with monsters. As the group tracks down leads and fends of new menaces, Amber’s time is running out on her deal with the demon. The climax keeps you guessing with high stakes and higher tension, a few shocks twist up the narrative and the book leaves a good set-up for what will come next. There were never any dull moments thanks to the hosts of monsters to face, almost every stop brings some new peril to the group. There were actually some very dark and gruesome moments as the story progressed, more than I’d seen from Landy’s previous work, but the light tone of the rest of the novel made for a good balance and stopped things getting too bleak. While I think it had a shaky start, I would still recommend the book for its wit and story, and I look forward to the next in the series. Written on 4th February 2016 by Aaron Miles.